Football could be said to be a game of contrasts; attack versus defence; what referees see and reality for example. A nod to this phenomenon would be here in Gloucestershire and our last appearance in the last 16 of a knockout tournament. Two years ago it was greeted with disbelief and hopeful anticipation as Sunderland went the same way as Chelsea. The 24,000 inside Valley Parade dwarfs the 1000+ rattling around Whaddon Rd for this game. Less ‘Are you watching BBC?’ and more ‘Are you watching anyone?’ Or should that be Shaun Harvey? The FA Cup run, part of the continued renaissance of Bradford City that removes us further from times where you could literally count all the City fans at a game. I viewed tonight’s fixture as an opportunity to reminisce about the ‘bad old days’. Almost as if it never happened or that it wasn’t actually that bad. (Ten years since our last relegation folks!) Ones which continue to fade into our recent past. It would be a rare chance left to visit a sparsely populated small ground and watch your team. There is a different sort of enjoyment to glean from these low-key affairs as well as the big time, like watching an intimate gig rather than a large arena show. It was a nice, convivial atmosphere amongst the away section. I was curious to see how both teams would approach the game. Cheltenham recording impressive wins against Everton, Bolton and Leicester whilst struggling at the foot of League Two, and us, trying to cement our place amongst the top teams in the league above. It quickly became apparent as to why Cheltenham had been so successful against Leicester youth last week. They are a very tall and powerful side. This combined with a very bobbly pitch would explain how they would have overrun a Premier League academy team. For those who weren’t there, this felt very similar to many performances from the last two months. Like we played down to the opposition and the first half had a familiar ring to it. We had the lion share of possession whilst lacking the speed and guile to unlock a deep-lying defence. The build up felt too slow, like those bringing the ball forward were allowing the defenders to get set. Nice triangles at the edge of the box but then the move breaking down. Turning infield and running across the pitch, allowing the defenders to keep their position between us and their goal. Not for the first time you felt like we were clearly the better side but somehow struggled to show it and assert our dominance on the game. The opposition were happy to allow us the ball until we got near their goal, where moves would stall. Cheltenham would then win the ball back, drive through the midfield with purpose and, more often than not, get a wayward shot away or win a soft free kick. The main thrust of the attack in the first half came from Mark Marshall, appearing at times on either wing, his best moment came five minutes from the interval when he did beat his marker, drove into the box, made the keeper make a save, it came out to Danny Devine, whose shot was straight at the Cheltenham goalie. We had another couple of crosses and weak shots, but nothing you felt was going to end up in the net. Cheltenham started the second half positively. Although they did have the ball in the net early on it was negated by the flag for a foul, saying that, during the build up there were two clear fouls on City players that were missed, which meant they kept the ball in our end. This scare was swiftly followed by another. Unlike ourselves, Cheltenham managed to engineer a strong run into our box, hold off Matt Kilgallon and fire a shot that was a sure goal but for Sattlemaier’s heroic, full-length save to his left. From the other end of the pitch our reserve keeper seemed to pull off the impossible. Other than the odd scare, Cheltenham rarely troubled our back line. Rory McArdle and Kilgallon smothered attacks both in the air and on the ground. Stephen Darby was very solid at an unfamiliar left back, regularly supported and overlapped his winger and laid a superb tackle on some poor unsuspecting Cheltenham player which left him on the ground. But Tony McMahon seemed at times very ponderous and hesitant on the ball. The impression was not of the usual all action, all mouth antics we’ve come to know. There were flashes, but without that drive inside him his game was lacking both going forward and chasing back. Timothee Dieng beside him in midfield also wasn’t on the form we had come to expect earlier in the season and at times left gaps behind him into which Cheltenham were happy to roam into and which he seemed unable to close down. At other times he was solid and kept tight reign on Cheltenham’s central midfield. Once the early second half scares subsided, we continued our territorial dominance. Josh Cullen, coming on to replace Romain Vincelot, whose first half in midfield was assured and confident, picked up where Romain left off. Neat passing, setting up attacks, linking play up nicely, although again without much threat on the goal itself. There again seemed to be a lack of early movement, othes making runs, finding space that a through ball could have found. When the goal came, we weren’t expecting it, like we were lulled into thinking there is more to the sport than the vulgarity of making the net bulge. A standard City free kick felt like it would be gobbled up by one of the giant Cheltenham defenders. But no! It found James Hanson, whose header never looked like it would reach the goal, but Cheltenham failed to clear which left Jordy Hiwula the simple job of leathering between the sticks. Hiwula was almost in again straight after the restart. An attacking ball through the centre, a Hanson flick on straight into his path (yes straight into his path!). To us, in line with the play he looked level, but the linesman’s flag saved Jordy as he lost control one-on-one, careered into a heap with the goalie and the ball trickled wide. As the second half drew on, Cheltenham reverted to long ball and head tennis as they started to run out of ideas. Billy Clarke made a welcome return for the last quarter and looked not too far away from full fitness. His best moment was a diagonal run into the right corner, received the ball, showed the defender down the line before cutting into the box. A shot from an angle was on but laid it back nicely to Devine in space, whose shot was blocked by the keeper. Danny himself was rather anonymous in the first half but seemed to grow into the game in the second. It wouldn’t be a City game with late opposition pressure whilst defending a 1-0 lead. Blocks and clearances bouncing back to the opposition, balls caught under feet and falling to Cheltenham and plenty of action around our box warped by the lack of depth perspective from the other end of the pitch, all made the last ten minutes feel more fraught that they should have been. The feeling was it would have been nice to see us kill off a team early, but it wasn’t to be. Although it wasn’t 20,000 at Valley Parade, although the Cheltenham supporters were engaging in a sponsored silence for the duration, although it’s in a dismissed and degraded tournament, although there are improvements to be made in taking us to where we want to be. There is still enough enjoyment to be had in watching and cheering on your boys (Knowing they could actually hear YOU! ), surrounded by a good bunch of City folk, to make it a worthwhile and enjoyable evening out. 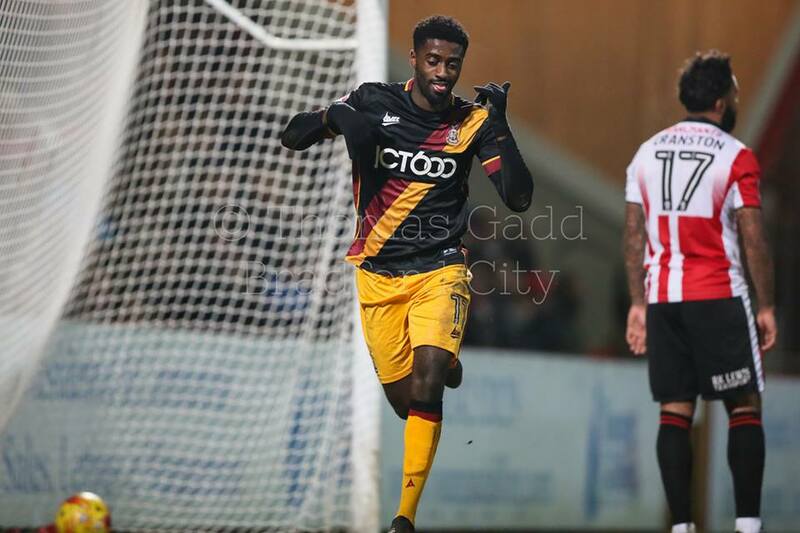 ‹ The week in review: the Checkatrade Trophy is a joke, the transfer committee is a radical Valley Parade strategy, and could an overlooked City striker be about to make it big in the USA? Have I missed something? What is a sponsored silence? Congrats on this report, and thanks for doing it. It was more of a joke at the fact the Cheltenham supporters never really attempted to sing, chant, clap, cheer or boo. They were very quiet all game, happy to sit in silence. So I made up the thought it was perhaps a sponsored silence, that’s all. We on the other hand, did. Fan-wise from those I spoke to, a good number of midlands / south-based Bantams made the trip as well as those from Bradford. Thanks for the report, and respect to you and the other 91 City fans that made the long trip to Gloucestershire, well done to the board as well for treating them to coffee and burgers. A nice pay cheque for the Club as well, should cover the above mentioned coffee and burgers !! I really enjoyed the match last night. It really took me back to my youth of watching City before VP was rebuilt. A great chance to watch the players close up. An earlier article on WOAP suggested that the History Makers could about to be history. Well last night Rory and Darbs were superb. Darby in particular was peerless – if I wanted someone to defend for my life I’d pick Darbs all day. I’d also mention Hanson – but won’t for fear of stirring up a hornets nest. Jordy’s a strange one. Not impressed for most of the match as he gave away a lot of ball but weighs in with a goal so I guess you can’t fault him. I get that he’s not the finished article and that he’s still young, but why should we be the ones to ‘bring him on’. Shouldn’t that be Town’s job? Also, both our front two spent the majority of match with their back to goal. If we want to score more goals we need to work out how to play so that our strikers are pointing in the right direction! I’d like to see Rory in at the weekend to help deal with Morrison. I’m still a big believer that RV and NKP could be our best centre half pairing but they struggled with a big physical forward at Shrewsbury and Morrison is in my opinion the best in the division at that type of role. In honesty I’d like to see us make a bid for Hiwula – don’t know when his contract is up. I can’t see him figuring at Town and might be able to get him cheap. There is a player there in my opinion if you work on the finishing. Best written match report this season. Can you do some more! Great piece. Agree about the fun of these low key matches. I’ve seen the other Checkatrade home matches, and its great to see some if the players who don’t regularly play in the league.Sattelmaier, for example, could in my view do as well as Doyle.